Eibach ProSpacer Élargisseurs de voie. 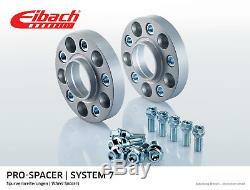 Epaisseur: 30mm PCD / Diamètre: 3x112 Alesage: 57mm Eibach Elargisseurs Système 7. Disc with a screw system. With centering collar (centering nose). Track change from 40 to 60 mm (disc thickness from 20 to 30 mm). Fastening: a disc at wheel carrier: by using special fixing bolts b wheel at disc: by using production (or accessory-wheel-) bolts. Two Pro-Spacer (=for one axle). Installation instructions and information on CD. Numéro de l'article: SMS90730028 Remarque. 01.01.2001 > 01.01.2004. 01.01.2003 > 01.01.2004. 01.03.2000 > 01.01.2004. 01.03.2001 > 01.01.2004. 01.06.2002 > 01.01.2004. 01.07.1998 > 01.01.2004. 01.11.1999 > 01.01.2004. 01.01.2004 > 01.01.2007. 01.04.2003 > 01.11.2005. 01.12.2003 > 01.11.2005. 01.06.2003 > 01.11.2005. Made from high-tensile-strength aluminum alloy. Exact fitment by using minimal production tolerances, resulting in exceptional wheel balance. All applications tested in rigid durability- and fatigue tests. High-grade corrosion protection through a special coating process (salt spray test according to DIN 50021). Significant weight advantage compared to wheel-spacers made from steel. Eibach Pro-Spacer is the ideal combination for use with the Eibach Pro-Kit as well the Sportline, if the original or aftermarket wheels are missing that last optical "kick". With the Eibach Pro-Spacer installed, the car looks wider and better, as the wheel fills the arch. Thats how the cars look gets its final touch. By increasing the track width, not only the appearance is improved, but you also achieve an optimized driving behavior combined with higher stability, as the roll of the chassis is influenced in a positive manner. Optimize the "sportive touch" to the last detail: wheels, tires, Eibach Suspension Components and Pro-Spacer! The Pro-Spacer is available in different versions from 5 to 30mm width. L'item "Eibach Élargisseurs 30mm pour SMART (MCC) CABRIO CITY-COUPE FORTWO ROADSTER ProS" est en vente depuis le mercredi 9 mai 2018. Il est dans la catégorie "Auto, moto pièces, accessoires\Auto\ pneus, jantes\Elargisseurs de voie". Le vendeur est "tunershop-worldwide" et est localisé à/en Naila, Bayern. Cet article peut être livré partout dans le monde.